That short walk across the stage represents many years of hard work, and if it’s happening at a college, many thousands of dollars in tuition. 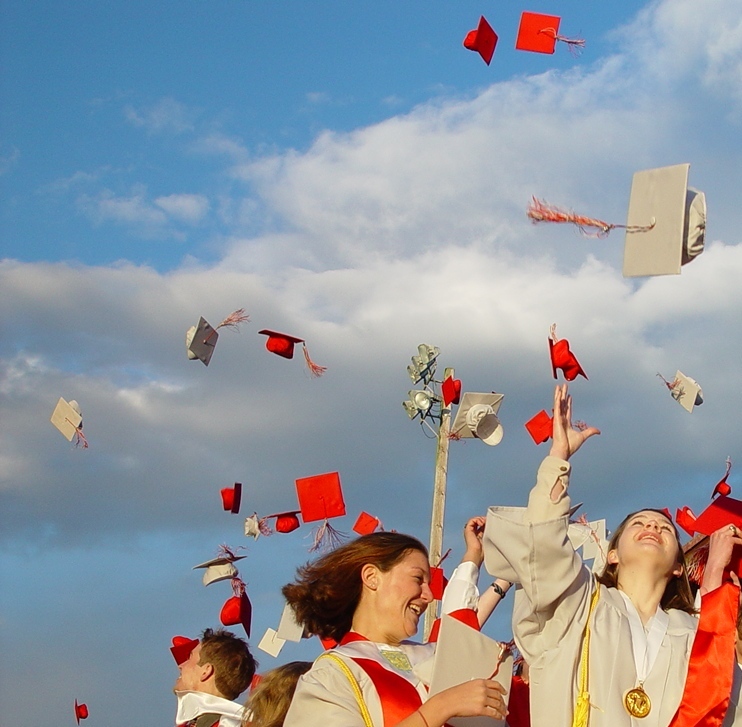 Whether you’re celebrating the accomplishment of a high school or university graduate, you want to give them a gift that truly reflects their sacrifice and achievement, as well as the excitement of embarking on a new path in life. 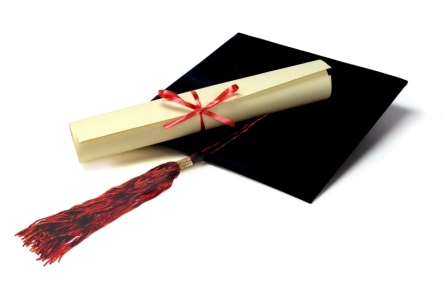 Here are four personalized graduation gifts that say “congratulations” to a new graduate, ranging from Freshman level (simply smart) to Senior level (high achiever). Bring a bouquet of flowers for photos after the ceremony. In the photos, the flowers will soften the lines of their monochromatic graduation gown. Later, they’ll serve as a reminder of their accomplishment for the next week or so. 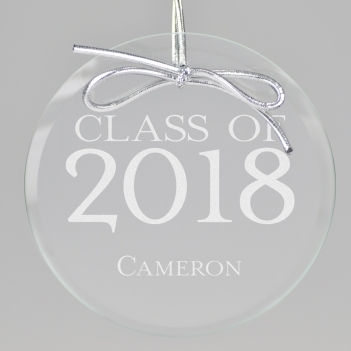 To personalize it, tie an engraved keepsake ornament, such as the Graduation Cap Keepsake Ornament ($17.95, free shipping) around the flower stems. After graduation day, they can pin this personalized glass keepsake to a bulletin board along with their tassel. Plus, years from now, they can hang it on their Christmas tree as a reminder of how far they’ve come in life. Finishing their school career is bittersweet. They’ll be leaving behind friends, familiar places and amazing memories. Give them a personalized, engraved picture frame, such as the Treasured Moment Picture Frame ($34.95, free shipping) to capture a cherished moment from their school days. 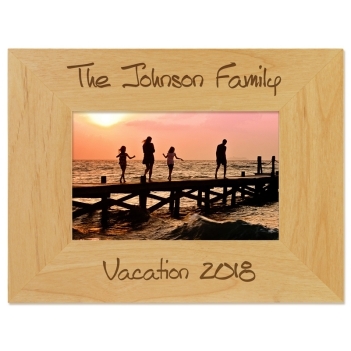 Their favorite photograph will enjoy pride of place in this solid wood frame precision-engraved with two lines of text. Tuck in a transit pass or gas card they can use in their new city, where they will build new memories and an exciting new life. 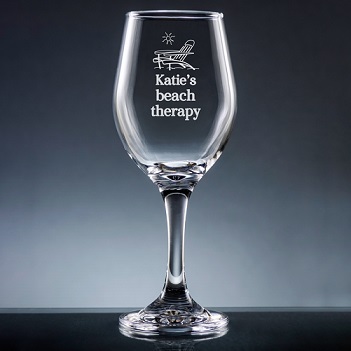 Here’s a super easy way to work in personalized graduation gifts into the mix: Help them exchange the red Solo cup for something a little classier: pint glasses engraved with their monogram. 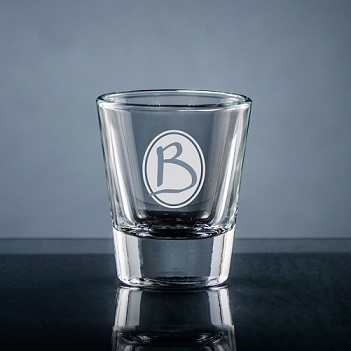 The Altamira Monogram Pint Glass ($24.95, free shipping) is a good choice. It features clean lines and a choice of lettering style. A set of four would be perfect, enough to invite friends for a potluck dinner party or game of cards. Inside each one, tuck in your favorite entertaining recipes, remembering to keep it simple for a beginner cook. Include ideas like: a recipe for guacamole; your two favorite cheeses and a crack brand that goes with everything; a simple pasta dish; or an easy strawberry shortcake. These days, the Millennial generation is drowning in digital communication. They are craving anything handwritten and tactile. Outfit them with the Henley Monogram Wardrobe ($62.95, plus $59.95 for envelope linings; free shipping). 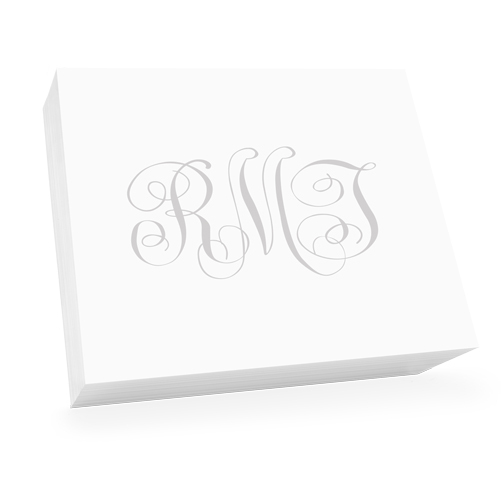 This graceful assortment of embossed, monogrammed papers will give them options to fit any occasion: Folded notes are perfect for the job search. Letter sheets help them keep in touch with far-flung classmates. 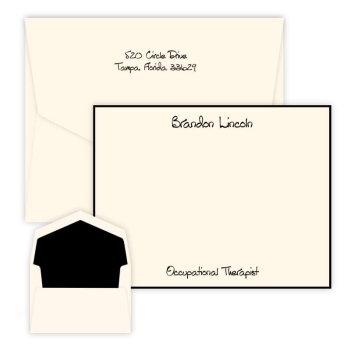 The set includes 50 letter sheets, 50 notes, and 50 enclosures with 150 paper-matched envelopes. Choose hand-inserted linings to make this stationery extra special. Whether they are moving back home or to a new city, give them something to write home about: a dinner at a hot restaurant or visit to a cute boutique in their new city, on you. Check TimeOut.com, Yelp.com or the city’s Chamber of Commerce website for gift card ideas. Graduation is an exciting time, filled with pride. 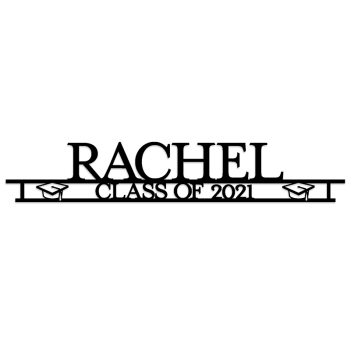 It’s also filled with anticipation, and possibly some trepidation about “what comes next.” Help new grads transition into the next phase of their life with personalized graduation gifts that make them feel recognized. They will cherish these gifts for a long time. A newly minted diploma is cause for celebration. The new graduate is jubilant. Parents are beaming like the sun with pride. The party is planned. You’ve dug out your favorite summer outfit and are ready to fête the student of honor and his or her new achievement. We’ve gathered our 3 favorite gifts we think no new graduate can do without. Any new graduate would love the Highland Card from Giftsin24. Customize it with a lettering style, ink color and optional border or hand-inserted envelope lining. Nothing says “grown up” more than having your own personalized stationery. Particularly for a college grad looking for a new job, think of all those circumstances where personalized stationery will really come in handy, from the interview thank you to keeping key professional connections alive. Monograms, names, embossed, raised ink, the possibilities are endless, but we particularly like the classic good looks of the new Highland Card. Because young people are so mobile these days, skip the optional return address. But a border or envelope lining or even 100% cotton paper could be very, very nice. Personalize the Treasure Moment Picture Frame and include a favorite photograph from the graduate’s school years. A new graduate probably has at least several cherished high school or college photographs. A special prom date. Earning straight A’s. Hanging out with your best buddies. Scoring the winning touch down. Giving a speech. Crossing a finish line. All of these moments and more make up the memories of our school years. We like the Treasured Moment Picture Frame, but we offer frames with other motifs that could work just as beautifully. You can personalize it with the graduate’s name, school, graduation date, nickname, small caption, or any other short message. 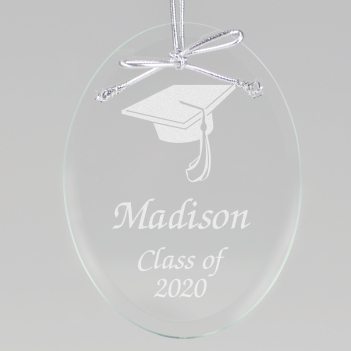 Personalize the Senior Class Keepsake Ornament to use as a gift, gift tag or table place marker. Every year, we open our box of Christmas ornaments to discover a treasure trove of memories, from a birth to family vacations, the school years and much more. Giftsin24 is proud to offer personalized ornaments that mark important occasions. These engraved glass ornaments also can be used as gift tags, table place markers, party favors and more. For graduates, we love the Senior Class Keepsake Ornament. It comes in clear or red glass and includes space for the graduate’s name. Presented with a silver ribbon in a velvet pouch, the ornament will serve as a proud reminder of the graduate’s achievement for years to come. 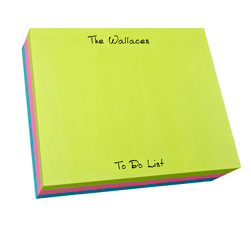 Reward the graduate’s hard work with a high quality personalized notepad from Giftsin24. Graduation. It’s an exciting time for many young adults, as well as returning adult students who seek to move ahead or change careers. They put in years of hard work, and now they are hopeful that their efforts will pay off in a rewarding job…or at least one that pays the bills. Create thoughtful gifts for grads with our notepads and memos, now on sale this month. Personalize one line with their name and the second line with “Class of 2015” or the name of their school or mascot. 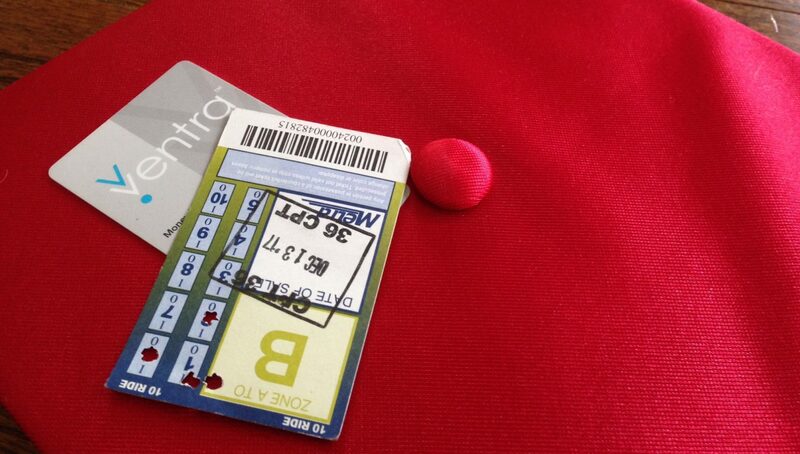 The new graduate will treasure this memento long after the notes of “Pomp and Circumstance” fade. Morning Glory Super Slab The Morning Glory Super Slab incorporates a lively cursive lettering style on two lines of personalization. Choose one of seven vibrant colors on this spacious square slab. It offers the newly minted graduate a place to write down job leads, imagine new pathways or simply decorate their new desk at work. Family Photo Desk Slab Incorporate a photograph of the graduation ceremony to commemorate the big day. This desk slab also includes a choice of 15 lettering styles, two lines of personalization and a small photo. Beautiful, thick, high quality paper makes this desk slab a treat! Watercolor Super Slab keeps your memos, lists and message organized and a pleasure to look at. Watercolor Monogram Desk Slab We can think of so many uses for our Watercolor Monogram Desk Slab: personal reminders, staff memos, love notes, gifts for grads…you get the picture! Featuring our Classic monogram in 7 soft colors, this desk slab makes a fresh, modern statement. The desk slab transitions from the graduate’s home to his or her office. Personalized stationery make perfect gifts for graduates. It’s that time of year…mortar boards are flying, proud young adults are smiling into cameras, and parents are wondering how the time flew by so quickly. 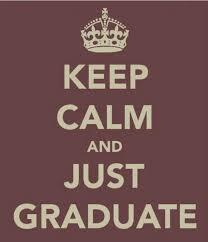 No doubt about it, graduation is an exciting time. Mark this milestone with a gift that announces entry into adulthood: personalized stationery. 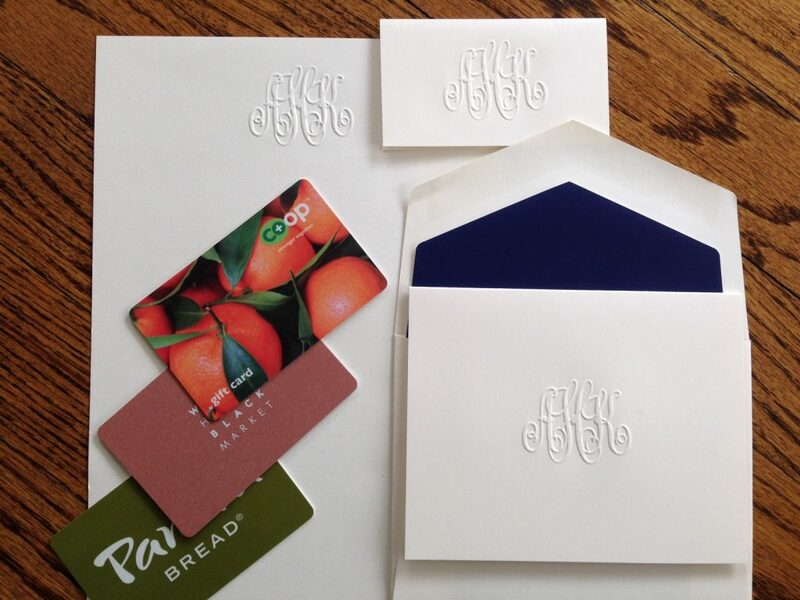 Nothing says “grown up” more than a fancy embossed monogram. And nothing’s more useful than a notepad to keep the job search or college assignments organized. 1. Notable Note: This colorful raised ink monogram feels bubbly and young. These folded note cards are perfect for writing thank you notes for gifts and job interviews. Come in a set of 50, with matching envelopes. 2. Paris Monogram Note: Flirty and feminine, these folded note cards will please any young woman ready to make her way in the world. Set of 50 includes matching envelopes. 3. 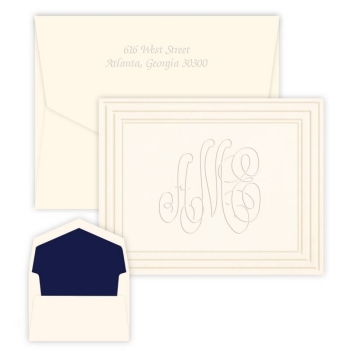 Stacked Monogram Card: With clean lines and a classic border, these single pane cards have a masculine feel. Set of 50 cards include matching envelopes. Super Slab Carnival is a practical and thoughtful gift. 4. Morning Glory List with Holder: She or he will be organized and ready for whatever comes next with this pad of lined sheets personalized with a name. The set includes 170 sheets, 25 envelopes and a holder. 5. Super Slab Carnival: A carnival of colors and large format make this a memorable and practical gift for the graduate. 250 7-inch by 8-inch pages in each pad.